Where did my long 4-day weekend go and how did Monday get here so fast? Wow. Monday started off with a bang … well a few bangs and plenty of bright flashes, mother nature woke me before my alarm at 5 AM with a beautiful thunderstorm, very rare in this area. 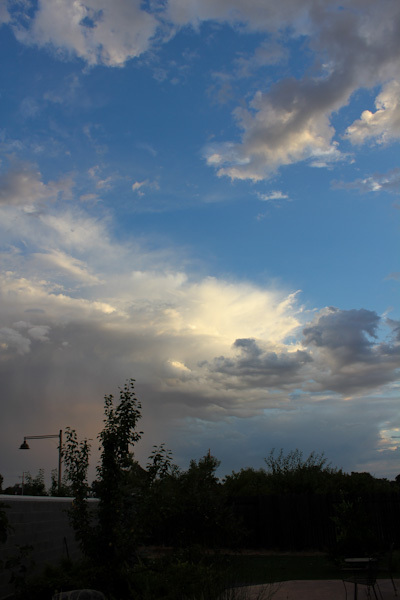 I just barely caught the last of the storm before leaving for work this morning, the clouds were gorgeous in the rising sun. Poor Leela was not a fan of the thunder and hid in the closet most of the morning. When eating at home over the weekend, I tried to keep things simple and healthy since there was a lot of decadent eating out too. 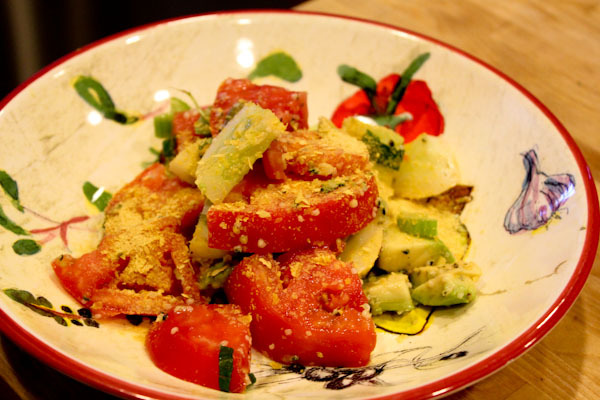 This colorful salad of a fresh farmer’s market tomato, chopped lemon cucumber, avocado, pumpkin seeds, and hemp seeds dressing with lemon juice, a Trader Joe’s seasoning blend and nutritional yeast hit the spot after spending a day at the fair in sweltering heat. 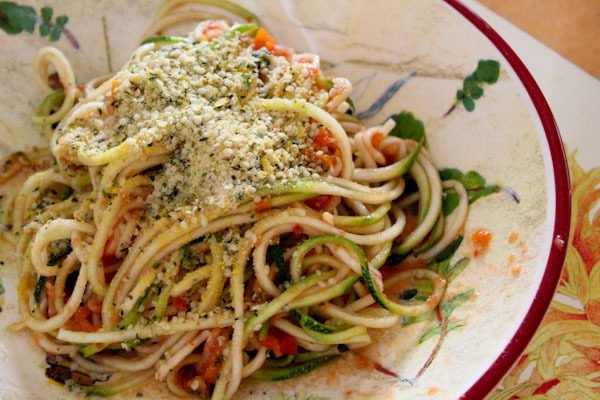 And a traditional raw dish of spiral sliced zucchini noodles, raw marinara sauce, topped with a season hemp seed nutritional yeast blend was also perfect for dinner last night after a day or triple-digit heat. 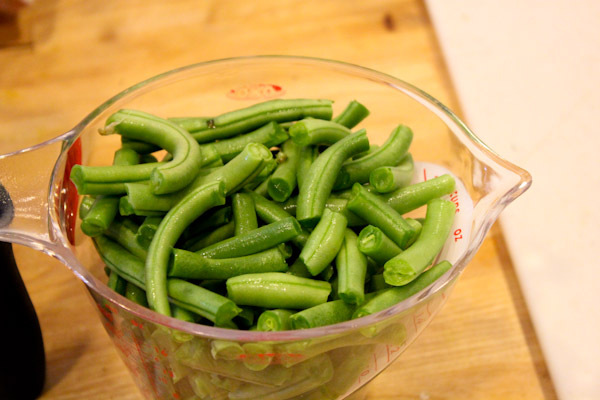 Tonight I grabbed fresh green beans to use that I scored from the farmer’s market. 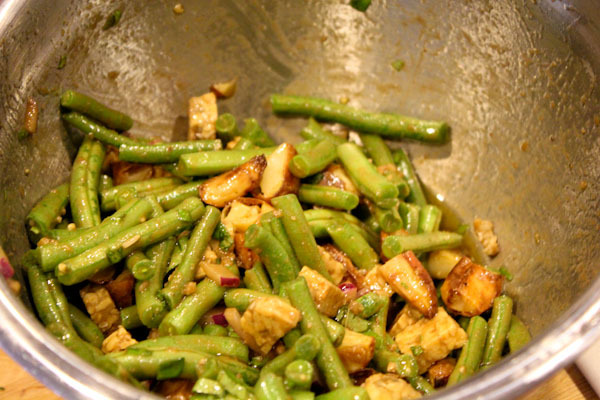 I adore raw green beans, I used to snack on them straight out of the family garden as a kid. The crisp flavor and crunch bring back a lot of happy memories of carefree summers. 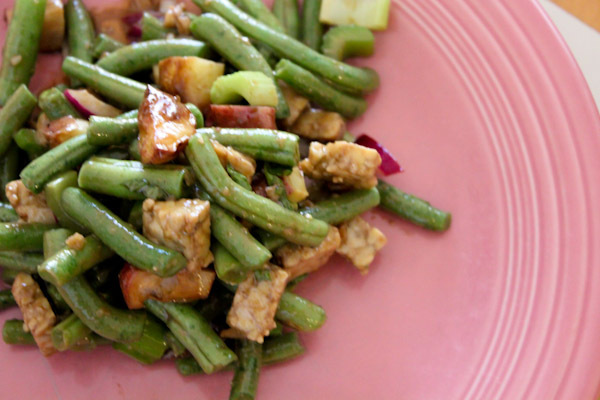 But I decided to add a daring and punchy flavor to these with a balsamic dressing that would work with just about any combo of ingredients from a traditional veggie salad to a chopped mesh of leftovers and cooked beans. 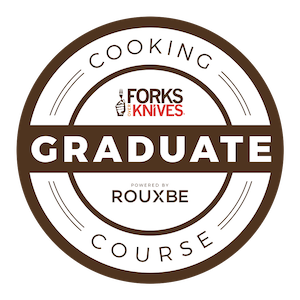 Whisk all ingredients in a bowl until thoroughly mixed and serve. Makes 4 servings. 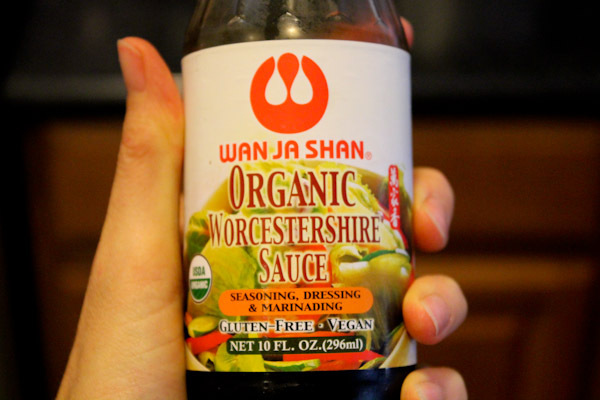 Finding a vegan Worcestershire sauce was not easy the first time I bought it, I recall wandering Whole Foods until I found it wedged between other exotic sauces. My salad ended up being a crazy combo of raw green beans, chopped celery, chopped tempeh, chopped basil leaves, chopped red onion, and leftover baked potato wedges I tossed in cold. Not a bad one-pot meal! The dressing has a slightly spicy, savory, tangy, and rich flavor that coated the salad ingredients well. And I had a begging dinner guest wanting a nibble of tempeh, one of his favorite foods. I love everything about that bean salad! A little nicoise-like, yes? (hold the egg and tuna, of course! LOL) Poor Leela! Ernie (the kitty) is a big ole bruiser but cowers under the bed during thunder. Thanks and yes, it made a fun and bright flavor combo after a hot summer day. Crazy to think that we lived in Florida with Leela for awhile before moving to California, I don’t remember how she survived all those storms! i know the weekend flew by! ugh…..as usaul i just love your salad and dressing creations :) happy tuesday girl! 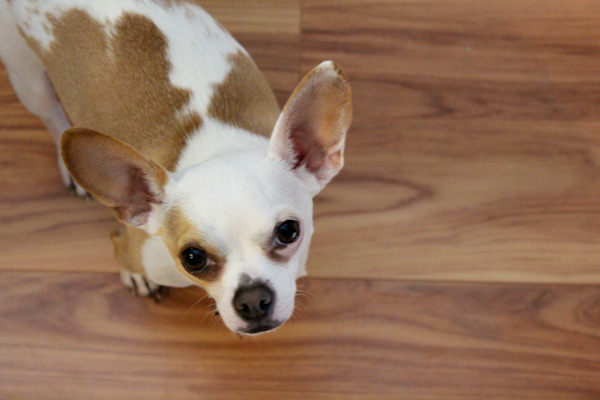 Your dog is totally adorable!!! Love the dressing.